Since most of the work that I do with teachers spans across several weeks, it can seem disjointed and disconnected. I wanted a way to connect with teachers between visits. I knew that there would need to be specific feedback and nonverbal cues for this to be successful. So, I tried using Educreations to narrate my ideas about teachers’ units in progress…After reviewing the feedback I’d provided (the second or third viewing for many), the units began to improve. The questions that arose were deeper and more pointed than before. Having specific feedback, delivered at an individualized pace, really moved the process forward. Shelly Blake-Pollock, the teacher and author of the TeachPaperless blog (http://teachpaperless.blogspot.com), encourages his students to publish online. Beyond that step, though, he offers feedback on their writing online as well via screencasts, or video recording of his computer screen. Screencasts, or “JingCrits,” that he creates are short, less than 5-minute video clips where he highlights student work on screen and offers feedback (View an example – http://bit.ly/bsgVQQ). So far, the reaction to Jing comments has been overwhelmingly in favor. In fact, both students and parents have been pushing me to produce as many JingCrits as my time allows. This kind of feedback can connect with auditory learners who may prefer to get their feedback in another format besides cryptic comments on a post-it attached to their piece of writing. The teacher reviews student writing online, offering specific feedback, recording the feedback as a video recording. The teacher reports taking only 5-8 minutes to record feedback that would normally take 20 or more minutes to write out as feedback. JingCrits get their name from The Jing Project, a free screen-recording tool available athttp://jingproject.com that enables you to post videos online. Using screen-recording tools to offer feedback–whether from teacher to student, student to teacher, student to student–can offer tremendous benefits to students. This kind of video/audio feedback contribute to the demise of one writing myth–“it takes longer to grade writing.” As Shelly’s JingCrit demonstrates, writing workshop facilitators can grade for discrete skills. The focus on the lead of a paper is helpful. Writing Workshop facilitators may be familiar with the Carroll/Wilson Analystic Scale for Classroom Use. The scale enables teachers to assess quickly and effectively what they have taught their students. Developed collaboratively with students, the scale embodies intelligent writing assessment. Simply, you only get graded on what you were taught. Imagine having students and teacher develop a Carroll/Wilson Analytic Scale for Classroom Use–centered around what has recently been taught in class–then offering video feedback on a piece of writing using that scale. The video of the Analytic Scale, shared online with students, serves as a perpetual “model” of how to provide feedback. Shelly has found a quick way to offer feedback his student writers need using screencasting. Some free web-based services that do not require you to install anything on your computer include ScreenToaster.com, ScreenCastle.com, and/or Screencast-o-matic.com. Online tutorials are available for each, but you should be able to get going fairly quickly with 15 minutes of exploration. Note: Even though the conditions under which Jing is available have changed, other options are available. My own experiments at the University of Warwick show that video feedback goes beyond simple language correction. In fact, it works best when you want to elaborate and expand on your feedback and not simply correct grammar or spelling, for example when you want to offer comments on an essay’s structure, content or ideas. In the language classroom, it is also useful for work on vocabulary. A teacher can take notes on pronunciation mistakes that are made in the lesson, and after class write the list into a text document, turn on the screen capture and read through the words and highlight where the stress falls. The resulting video can then be sent to the whole class. Teachers could send a weekly video of pronunciation mistakes or vocabulary they want students to learn. We know from research that students value face-to-face feedback, but with large classes this is not always possible. So could screen capture offer an alternative? Students seem to think so. “It’s as if my tutor is sitting next to me,” is a common comment the OU are hearing. Students find it engaging and many point out they play the feedback several times. Imagine that you have a video that you would like to have your students watch on their own, but you would like to include your own notes as they progress through the video. This will enable you to do that. Imagine that one of your students have just made a recording of a lesson that they taught in their student teaching. 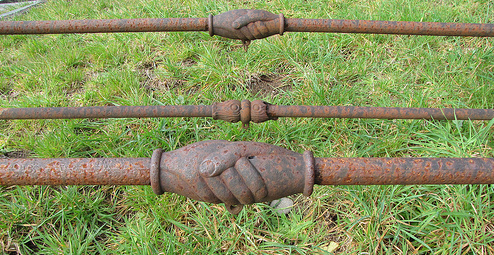 She has posted it in her digital portfolio and then shared the link with you. You have the opportunity to provide time-line based feedback. VideoANT from theUniversity of Minnesota is an online tool that allows you to annotate videos. This system allows you to identify significant parts in the video and then make synchronized annotations…VideoAnt is limited to working with files that are online. The only way that you can specify a video is to provide the URL for it. These videos must be .mov, .flv and YouTube files. Another possibility is using Skype (free but not friendly to school networks from IT perspective) like Anne Mirtschin (@murcha) describes in her blog or Adobe Connect (costs money) to offer live feedback that is recorded and then saved for individual student viewing or class viewing. Have you thought about offering video feedback, whether on K-16 or adult learning projects? I’ve been thinking about using videocasts for offering feedback on administrative tasks, such as budget proposals, web site design, etc. Are you getting international help on questions you have? If not, you are missing out! Build your BRAIN or PLN! So, I whipped out my Macbook and used that for the conversation (I use Call Recorder ($20 with free upgrades) and it works flawlessly for video and/or audio recordings…I bought it ages ago when I was unenlightened and didn’t use GNU/Linux)! 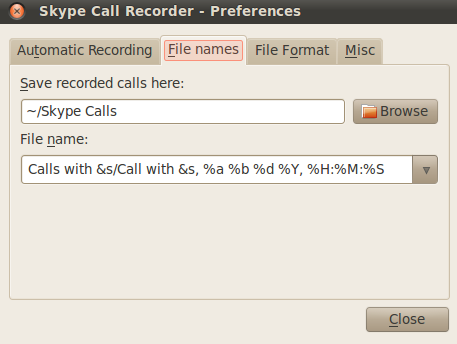 But the question remained, how does one record Skype on UbuntuLinux? As I waited on one end–the other person was having trouble with his microphone and laptop–I sent out a Plurk request for help, with two responses. The first via Twitter direct message from Kathy Shrock was a link to a general Skype page. Unfortunately, that link was out of date with the information posted on it since I was using Lucid Lynx. 1) Download Skype – You can get it from the Skype web site. At the time I wrote this blog entry, Skype 2.1 Beta 2 was available. 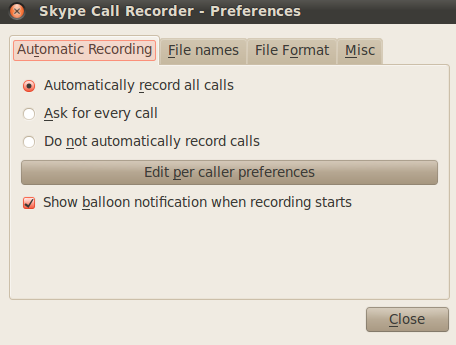 To activate Skype Call Recorder, I had to set up a custom application launcher, or at the command line, type “skype-call-recorder” to start it up. As you can see, the preferences aren’t that hard to get. 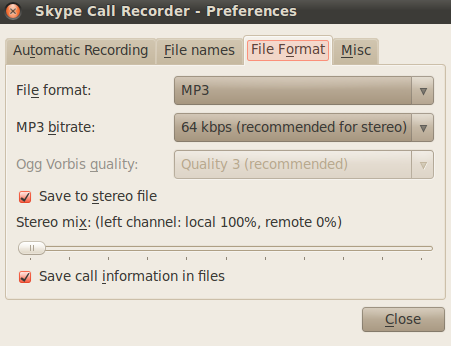 To test the recording, I went to the panel icon and selected “Browse previous calls,” which fetched up a window on my hard drive with the saved calls. I made contact with Skype Test Call and recording came through without problem! Thanks to Kathy Schrock for her link, y gracias Rosa (pictured below) from Spain!! Skype in Schools – Adjust Your Sails! A short two weeks ago, if that, Christian Long, Brian Lamb and I were trying to get a better understanding of Skype use in schools. One of the primary issues that was difficult to explain was, “If Skype is free for use, what school district would choose to NOT allow teachers to use it in their classrooms with students?” Why would districts pay for service they can get for free? The only real objection would be if such usage would place the District or its users in a position of liability. You know, with so many wonderful tools, it’s easy to focus on the 2-3 that are banned. But are the reasons for banning those technologies actually valid? And, how often do school districts “change their mind?” Wouldn’t it be heartening to actually witness that kind of change, the kind of change where school districts change their policy in response to reality? An objection that districts offer is that Skype allows un-logged chat. That is, if students use Skype on a computer and an inappropriate chat occurs, then there will be no log of that the District can refer to later during an investigation. Simply, the classroom teacher could delete his/her account, and maybe that log would be gone. Or, a student could have an account, login to Skype and have unauthorized chats with other people outside the supervision of a teacher. Assuming you can overcome objections to the use of Skype–choosing to trust the teacher to monitor Skype use and model appropriate use of Skype to students, holding students accountable for inappropriate use without trying to block the “tool” that was used wrongly–some districts may bring up another objection. Or are you a business partner that pays for SKype in the schools to provide instruction? The main thing that strikes a chord with me in terms of fair use is that Skype does have Small and Large Business accounts. These are purchased accounts. So in relation to that, if the conversation is running through a business network, even if it is an individual teacher account and this action is condoned by the organization is that not making a loop hole in their marketing strategy to get businesses to pay for service. I have had teachers ask to use it, in classrooms. I have denied this ability because of fair use and the points made below…now, before every tech director says “Ohhhh” We do have Adobe Connect in the district and a web-conference (same setup as skype) can be setup with anyone, anywhere with an internet connection. So, I am not limiting the ability to have guests etc through electronic means in the classroom, I have just discouraged and not approved skype due to concerns related to copyright. This situation reminds me of when AVG first came out. Everyone started using it because it was “Free” (the district I was in at the time was using it) only to find out that we had to later remove it from all machines and pay for the service because we fell into the business category. In my current district, we use AVG, but at a cost. If skype is free and does not pose this same issue….then I am all for eliminating the costs of other products and going the “free” route. Skype is not the issue…But with the emphasis that I have placed on Copyright and Fair USe within the district, I want to be sure that we are in line legally. Inferences and Asking for Forgiveness rather than Permission is not something our legal system appreciates and can get individuals in some sticky situations. Skype use in schools should be disallowed because Skype itself does not address school use, although ample examples of Skype use in schools are featured in their blog. . .but such examples are not sufficient to justify schools who are trying to err on the side of caution. Legal use of Skype by a school district is prohibited and if Technology Departments are going to model copyright and fair use, then it shouldn’t be allowed in schools. For pay companies–like Adobe Connect–are equivalent to Skype in function but eliminate the uncertainty districts experience when using Skype. Yet, are these arguments really on target? Are they “correct” or accurate to the reality of Skype? In truth, we can only know the answer to that question by contacting Skype and getting a ruling. Hello Scott, Thank you for contacting Skype Support. We are happy to hear that you are using Skype. We suggest you to check our Terms and Policies, and if you won’t violating these rules, you can use our services in this way. You can find it at http://www.skype.com/intl/en/legal/ Should you need more assistance, feel free to contact us again; we will be glad to help. 4.4 Utilization of Your Computer: If Your use of the Skype Software is dependent upon the use of a processor and bandwidth owned or controlled by a third party, You acknowledge and agree that Your licence to use the Skype Software is subject to You obtaining consent from the relevant third party for such use. You represent and warrant that by accepting this Agreement and using the Skype Software, You have obtained such consent. Simply, does this response mean educational institutions–including K-12–can use Skype in classrooms? The answer appears to be YES. Some time ago, I wrote a short blog entry featuring one educator’s use of GoogleForms to create Civil War quizzes. 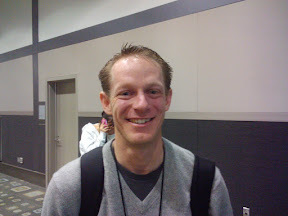 I hadn’t met the educator–Dwight Goodwin–who prepared those, but we had a chance to meet (Thanks to Randy Rodgers) at TCEA and he shared his perspective on using GoogleForms with students. For fun, I threw a few curve balls at him regarding FERPA, etc. to see what his response would be and I loved his answers! You’ll need to listen to him…. Dwight also shared how he’s using webcams and Skype in his district to connect to people in Uganda. Again, this was fun to discuss. 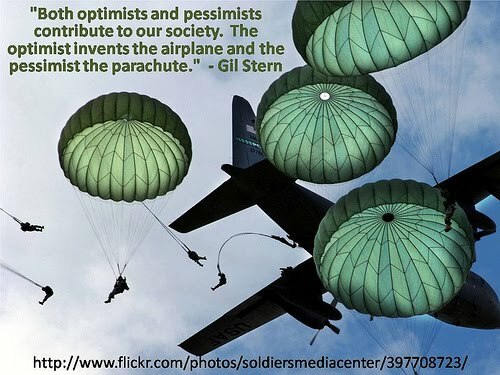 Thanks to ChristianStill for sharing the following image with me…it’s appropriate!